In this episode, Martha offers a primer on this favorite starch. She begins with Scalloped Potatoes, also known as Potatoes Gratin: thinly sliced potatoes cooked in milk and baked in a cream mixture with cheese. Next comes a recipe that’s become synonymous with American food: Potato Salad. Then, in case your go-to mashed potato recipe needs an upgrade, Martha shows a few tricks to achieve the perfect Puréed Potatoes. 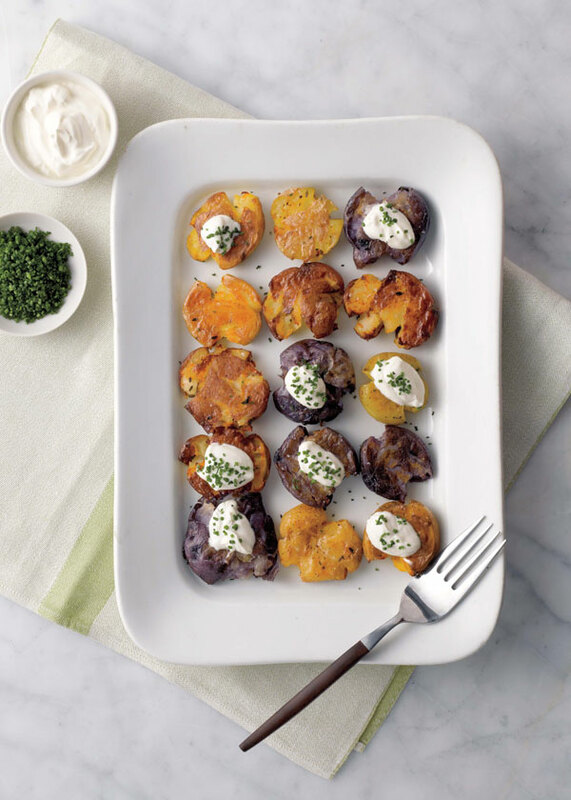 Finally she shows how, in just a few easy steps, anyone can make Smashed Potatoes — crispy on the outside, creamy on the inside. Martha makes scalloped potatoes ahead of time by partially cooking them in milk and holding them on the stove. When the rest of the food is being prepared, just take them out of the milk, layer them, and bake them. This scalloped potatoes recipe appears in the "Potatoes" recipe of Martha Stewart's Cooking School. Preheat oven to 325 degrees with a rack set in the lower third of oven. Combine sliced potatoes and milk in a large saucepan over high heat. Bring to a boil and immediately reduce heat to low; cover and simmer until potatoes are just tender, about 3 minutes. Place a colander over a large bowl and drain potatoes, reserving milk. Add heavy cream to milk and stir to combine. Rub a 2 ½ -quart oval baking dish with garlic and 1 tablespoon butter. Arrange sliced potatoes, sprinkling cheese between the layers, in the baking dish; season with salt and pepper. Dot with remaining 2 tablespoons butter and pour reserved cooking milk and cream mixture over. Transfer baking dish to oven and bake until cheese becomes deep golden brown and milk has reduced and thickened, 80 to 90 minutes. Remove from oven and let rest for 5 to 10 minutes before serving.